This hair extensions is strip Piano color #6/613 Brazilian virgin tape hair extensions. Piano color tape hair extensions is made like the Piano key one color by another color and that's why it's called Piano color tape hair extensions. Hera is the best piano clor tape hair extensions manufacturer and wholesaler in Qingdao, China. 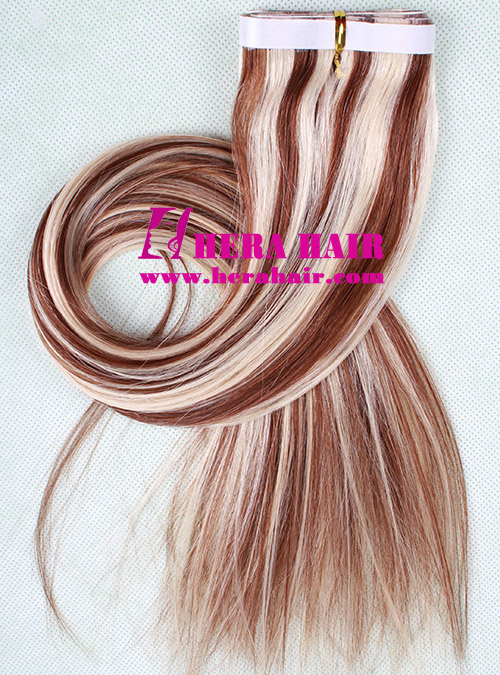 Normally speaking, the Piano color tape hair extensions minimum color width is 1cm, you also can do 2cm per color, which piano color make your hair highlight. Hera's regular tape hair extensions default size is 4cm*0.8cm per piece and it's 40pcs/pack; But we also can do long strip tape hair extensions, which does not cut the tape hair to small pieces so you can cut that according to your special requirement. About the long strip tape hair extensions, it's 2 strips per pack because our PU's max length is fixed. Hera has many kinds of hair materials for your choice, such as Indian remy hair, Indian virgin hair, Chinese virgin hair, Malaysian virgin hair, Mongolian virgin hair, European virgin hair etc. Hera mainly do wholesale tape hair extensions business, so no matter you are hair wholesaler, hair retailer, hair shop owner, hair salon owner and hair stylists, we welcome you wholesaler piano color tape hair extensions from us. We also can accept your supplied hair to produce tape hair extensions. Hera could do almost all mainly hair products in the market, so if you have any requirement, please feel free to contact us.